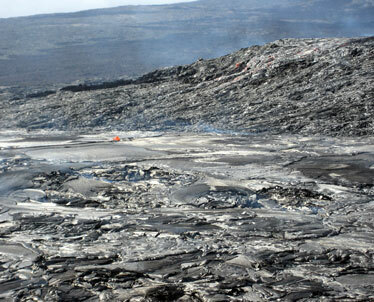 Lava flows from Kilauea Volcano headed for the Royal Gardens subdivision on the Big Island yesterday. This is a close-up of a small dome fountain from the top of the new rootless shield. Fingers of smooth, ropy lava from Kilauea Volcano pushed toward Royal Gardens yesterday, getting within 1.4 miles of the subdivision before stalling, according to scientists at the Hawaiian Volcano Observatory. There are just two residents left in the remote community, which has been overrun by lava numerous times in recent decades. 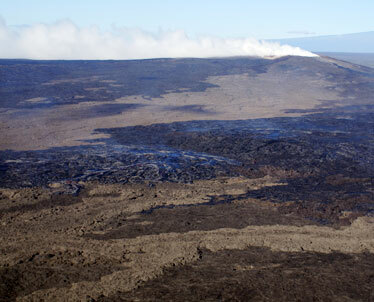 The current lava flow is coming from a chain of shield-shaped mounds that have formed above the main lava tube created by the Thanksgiving Eve flow. Another shield is under construction near the latest breakout point. "We just found a new one this morning," said Jim Kauahikaua, scientist-in-charge at the observatory. The collection of shields is a little more than two miles uphill from Royal Gardens, a distance that lava could cover in a week. But the formation of the mounds tends to slow down the flow. "More lava is consumed in shield building and less in extending the flow," observatory scientists wrote in the current issue of Volcano Watch. "This is good news for communities downslope." The mounds are known as "rootless shields" because they are not fed by deep magma chambers, but instead form above shallow lava tubes flowing just under the surface. The largest of the shields is more than 100 feet high and 1,000 feet in diameter. They are not completely stable, and can rupture or collapse and spew more lava. 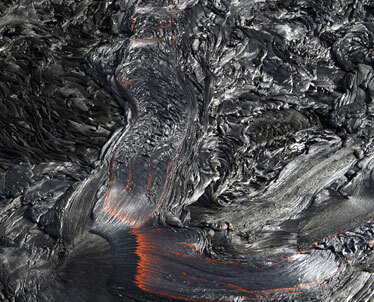 Lava issued yesterday from an older rootless shield between the Thanksgiving Eve Breakout vent and the new shield. The new rootless shield (shiny lava in left center), the rootless shield that collapsed two weeks ago (fume in center) and Puu Oo and Mauna Loa in the background.